Aerojet Rocketdyne is the prime contractor for the flight proven, high-performance RS-25 engines used to propel America’s next-generation heavy lift launch vehicle, NASA’s Space Launch System (SLS). Four RS-25 engines located at the bottom of the core stage will power the rocket on its eight and a half minute climb to space with more than 2 million pounds of thrust. The RS-25 evolved from Aerojet Rocketdyne’s Space Shuttle Main Engine (SSME) that successfully powered 135 flights of the Space Shuttle. The engine underwent five major upgrades during its life on Shuttle, each time incorporating the modern technologies and innovations – and each time demonstrating major improvements in safety and reliability. Between the shuttle program and the SLS program, the RS-25 and SSME engines have collectively experienced more than 1.1 million seconds of use. 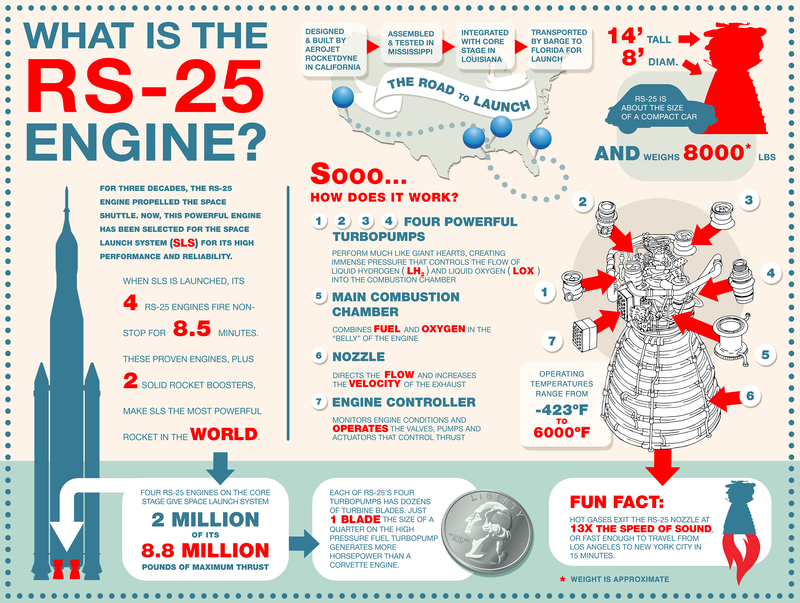 The RS-25 is a staged-combustion engine cycle powered by liquid hydrogen and liquid oxygen, making it one of highest performing engines the nation has ever produced. The SSME engines on the Shuttle typically operated at 491,000 pounds vacuum thrust (104.5-percent of rated power level). The required power level for the RS-25 engines that will fly on the SLS is 512,000 pounds vacuum thrust (109 percent of rated power level) to augment the vehicle's heavy lift capability. Future evolutions will have even higher thrust capabilities. Aerojet Rocketdyne has begun developing a new generation of RS-25 engines for when the 16 engines remaining from the Space Shuttle program are used. These engines are targeting a 30% cost reduction from the engines that flew on the Space Shuttle and will feature the latest in advanced manufacturing techniques, including 3-D printing.